The Pakistani Prime Minister Mian Nawaz Sharif paid an official visit to the United States of America from October 20th to 23rd, 2013. The visit and his talks with President Obama received widespread attention and media coverage in both countries. Pakistani and USA media coverage of the visit highlighted various critical bilateral issues between Pakistan and the US. The key issues of counter terrorism, non-proliferation, the end-game in Afghanistan, shared democratic values, economic growth, aid for energy and social sectors, defense cooperation, nuclear security and regional cooperation were among some of the topics discussed. It was interesting to note that the American media did not portray a very positive outcome of this visit; an article published in The Washington Post on October 21st, 2013 that Pakistani and US leaders aimed to bolster ‘troubled ties’ only with an eye on the end-game in Afghanistan. Pakistani media on the other hand mainly covered issues like drone strikes, strategic dialogue, trade and aid. 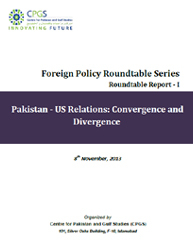 In this backdrop, CPGS conducted an in-house Roundtable Discussion, with a select panel of prominent scholars and experts on Pakistan-US ties, to evaluate and discuss “Pakistan-US Relations: Convergence and Divergence”, in order to build a fair understanding of the current and future Pakistan-US relationship.